Finally, a rain cover made specifically for 3-wheel cart owners! Structural Foam Hood and Full Bag Design stand out from the crowd. Convenient side and lower pocket access panels with a rainproof pocket for your scorecard. Easy club access and has a unique high wind protection strap. When it rains it pours. And when it pours, the Cloudburst Rain cover is a perfect solution for protecting your bag and valuable contents. 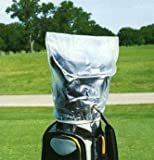 Covering the top of your golf bag is fine in light rain, but when the skies open up the pockets and their contents need complete protection to stay dry. The Cloudburst convertible rain cover can be installed in seconds and quickly converts from full length to half for a light drizzle. With the convenient storage bag the Cloudburst Rain Cover can be with you every time you play. .
Any Way You Play It, Rain Wedge Fits Your Game! Let’s face it, sooner or later everyone gets caught in the rain – even you. That’s why we developed Rain Wedge – the premier rain cover on the market. Its unique design allows you to use one hand to flip up the cover while your other hand quickly removes a club from your golf bag. Rain Wedge Premier Golf Bag Rain Cover features: Approximately 42″L x 2.5″W (when not in use) Made from durable waterproof rip-stop nylon Grip clips & handle strap keep Rain Wedge firmly in place Locking zipper ensures the cover will remain secure and closed Velcro straps offer coverage adjustability Adjusts for carrying pull carts and motorized carts Adjustable to almost any golf bag Retractable rods system gives you a 14″ clearance from the top of your golf bag (enough clearance for most long drivers) Retractable rods make sure Rain Wedge holds its shape, keeping the cover taut and away from your clubs for quick easy retrieval Stores inside your golf bag like a club Color: Black Blue Because Sooner Or Later, Everyone Gets Caught In The Rain! This versatile rain cover provides protection and easy access to all pockets on your bag. It stays soft in cold weather and wraps easily around your bag with Velcro fasteners. Dual zippered opening allows for easy access to clubs. The Click gear Golf Bag Rain Cover is made from double lightweight waterproof nylon with water-resistant zippers. 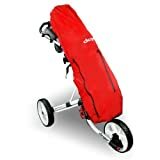 It’s made to install quickly and easily with two clip-on adjustable nylon straps to secure it to any golf bag or push cart. It’s made to keep your bag and gear dry in wet weather. When installed, you can easily access your clubs and pockets through the three water-resistant zippers. It fits perfectly with the Click gear B3 golf bag and Click gear Model 1.0, Model 2.0, Model 3.0 and Model 3.5 Plus carts. Protects clubs from rain and moisture. Easily secures to most golf bags. Velcro closure allows for easy club access. Protects clubs from rain and moisture. Easily secures to most golf bags. Velcro closure allows for easy club access. The popular Drizzle Stick, now with convenient flex shaft allowing for easier club access. The ultimate wet weather golf club protection. It opens in seconds allowing quick and easy access to all clubs. Telescopic shaft stores neatly in your golf bag. Extra deep canopy and inner liner provide protection between golf clubs and umbrella frame. The Seaforth Full Bag Cover is great for the golfer who likes to play all year round, even in the worst weather. This covers the entire bag and protects the clubs, bag and pouches from the rain. Easy to use, and allows easy access to clubs and pockets. Keeps everything you want dry. 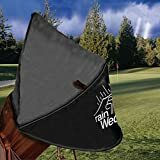 Find more Golf Bag Rain Cover products on Amazon!